Maduro earlier dismissed the US promise to send relief aid to the crisis-hit South American country as a "political stunt" and a pretext for invasion, as Washington has refused to recognise the legitimate government of Venezuela, also imposing sanctions on Caracas. READ MORE: Venezuela Humanitarian Aid: 'Noble Gesture' or Demonstration of Strength? "Venezuela will not allow the show of… humanitarian aid because we do not beg from anyone", he told reporters. "Venezuela is not suffering the humanitarian crisis fabricated by Washington over the last four years to justify intervening in our country." The president also stated that Venezuela planed to increase oil production by 1 million barrels per day in 2019. "We are coping well with difficulties, our oil industry will move forward, despite the aggression, there are enough oil markets in the world for oil produced by Venezuela," Maduro said at a press conference broadcast in his Twitter blog. Maduro confirmed that he is ready to hold early parliamentary elections in the country in order to end the ongoing political crisis. According to him, at least 2 million people have signed letter demanding that the US stop interfering in Venezuela's internal affairs. "I propose early elections to the National Assembly, and I will ratify them," Maduro told reporters, adding that he would like to "see people voting for a new National Assembly that will help the country and contribute to its stabilisation." He also said that Caracas is ready to support the "Montevideo mechanism" or any other initiative aimed at contributing to dialogue in Venezuela. Maduro rejected, however, the EU-backed contact groups as biased, stating that the bloc is "deaf", as it would not listen to Venezuela. According to him, Western countries want to destroy Venezuela in order to exploit its natural resources. "The plan for Venezuela is more or less similar to what they did with Libya in order to seize its natural resources […] a fifth column was planted inside the country, but here they could not achieve what they managed to do in Syria and Libya". "We will not allow them to form terrorist groups in Venezuela", he concluded. 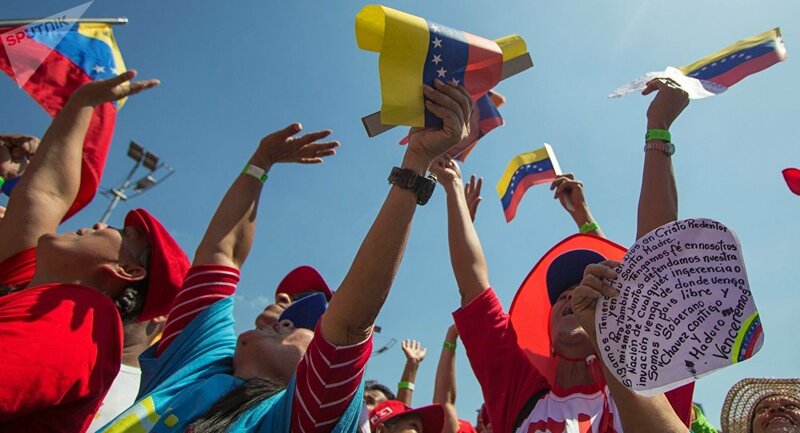 On 4 February, the administration of Juan Guaido, the self-proclaimed interim president of Venezuela, said that they would hold an international conference in Washington on February 14 to seek emergency humanitarian assistance.